Hello crafty friends! Hope you are having a great week so far. Today we have two cards that we created following a simple and easy technique: stencils + distress oxide inks + texture paste. Stencils are so versatile and there are a lot of different looks that we can achieve using a variety of techniques that we will be demonstrating in future projects. So make sure to keep an eye out for that, but for now, scroll down to see how we created these "Joy" and "Celebrate" cards. 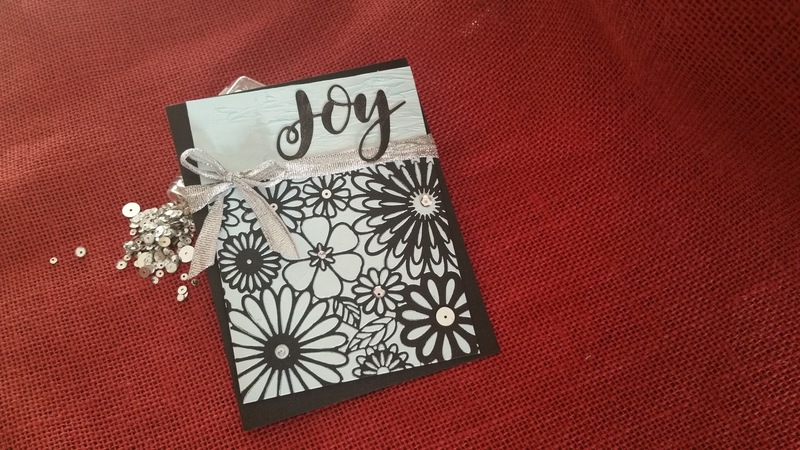 For the first card, we started by applying texture paste mixed with broken china distress oxide ink, over the flower frenzy stencil onto a black piece of paper. We added the leftover texture paste on a small piece of white cardstock. After allowing both pieces to dry, we backed them with a foam sheet and adhered it at an angle on the card base. 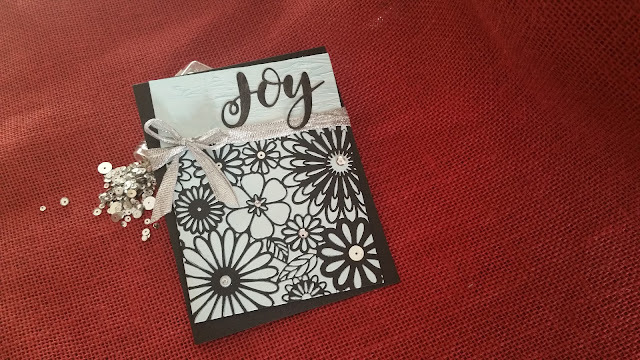 Next we cut the word "Joy" out of a black piece of paper and glued it on the background panel. 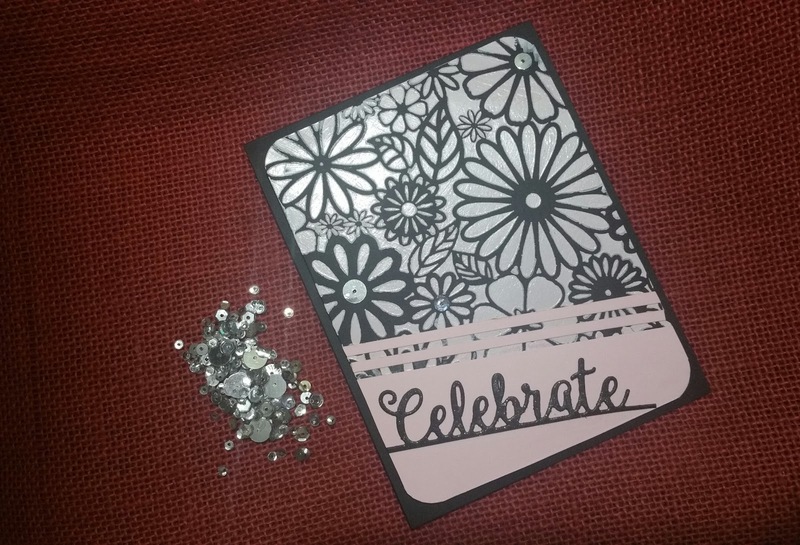 Then we embellished the card with silver sequins and finally tied a silver ribbon onto the card. 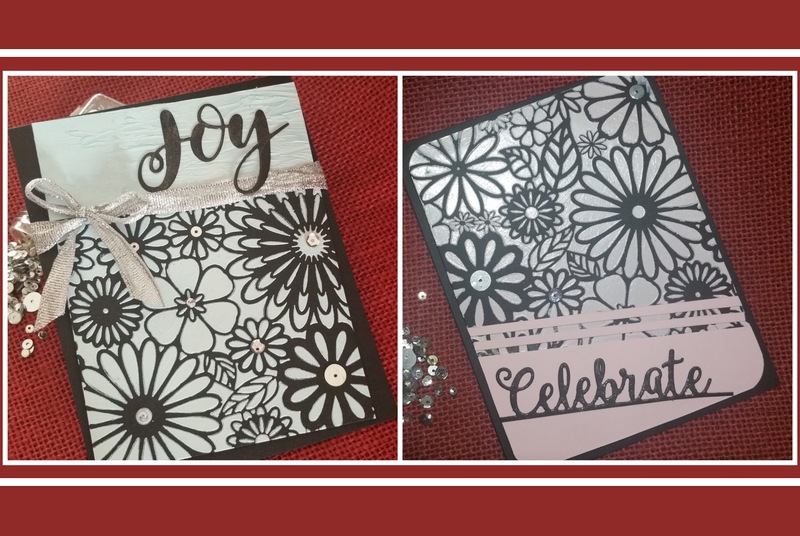 For our second card, we applied texture paste mixed with worn lipstick distress oxide ink, over the flower frenzy stencil onto a black piece of cardstock. After allowing it to dry, we adhered an angular piece of baby pink cardstock to the bottom layer and added two thin strips of the same cardstock over it on the background panel. Next we rounded the four corners with a punch, backed it with a foam sheet and adhered the panel to the card base. Then we cut the word "celebrate" and adhered it on the card front. Finally, we added a few silver sequins to embellish the card. Want to make these cards? Purchase the DIY kit and follow the instructions to create these cards from the convenience of your home or walk into our studio to explore the tools, learn the techniques and go home with completed projects that are made with your own hands. As always, we are here to help you discover your creativity with lots of project ideas and inspirations that makes your craft life easier. We keep simplicity in mind while creating each project and we strive to deliver highest quality DIY kits with easy to follow instructions. Like this project? Pin it and save it to one of your Pinterest boards for later. And be sure to follow us on Facebook, Instagram, Pinterest, Twitter and YouTube. Your creativity is our biggest inspiration, so show us what you have created by posting your artwork on Instagram or Facebook using #imadeitwithartizin.